Frank Kassela - double bracelet winner! 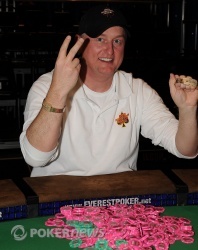 Last year was the year of the multiple bracelet winner, and it took forty long events to find our first one at the 2010 World Series of Poker. Frank Kassela, a husband and father of five from Memphis, Tennessee has just completed his climb to the top of the pack for the second time this year, besting a field of 365 runners to take the only razz bracelet in the display case. Kassela is your champion of Event #40, and this $2,500 Razz event pays him nearly a quarter-million dollars along with a bracelet to go on his other wrist. 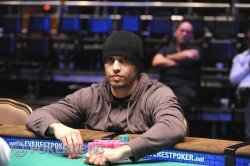 Kassela came into the final table third in chips, one spot behind eventual runner-up Maxwell Troy. The two men picked their spots carefully, and some twelve hours after play began on Day 3, they were heads up for the title. The battle was a long one; it's always a grind to close out a short-handed razz table. Kassela finally started to gain some momentum as the increasing antes and limits forced the play, though, and he was able to close out Troy just before the clock struck five in the morning. It should be noted, for all you short-stack ninjas out there, that Kassela was a long way away from this spot at the end of Day 1. He bagged up just 5,100 chips on Monday night, putting him in 105th position out of 105 returning players. No matter for him though; Kassela had a great Day 2, and he was able to put himself into a position to win during the early stages of this Day 3. Frank Kassela is the toast of the town tonight, and his accomplishment is one of the highlights of the WSOP thus far. We send him our congratulations on another fine run this summer, and he's still got a few events to try and put him in the elite tier of triple bracelet winners. That's all we have for you tonight, but we'll be talking about this one for a long time to come. Until the next one, goodnight and good morning from the Rio! Maxwell Troy Eliminated in 2nd Place ($132,229); Frank Kassela Wins! Maxwell Troy brought-in for 20,000 only to have Frank Kassela complete to 80,000. Troy two-bet to 180,000 only to have Kassela announce "raise!" With Kassela making a seven-five low to best Troy's seven-six, Troy hit the rail in 2nd place for a $132,229 payday as Frank Kassela is crowned a WSOP champion for the second time this series! "Always a bridesmaid!" uttered Troy as he walked passed the PokerNews blogging desk in reference to his recent runner-up finish just a week ago in Event #27: $1,500 Seven Card Stud Hi-Low-8 or Better. Maxwell Troy completed with a up, and Frank Kassela defended his bring-in with a in the door. Kassela led the betting on fourth, and Troy called him quickly. On fifth, Kassela checked, and Troy fired out the bet of 160,000. Kassela called. On sixth, Kassela took the back the lead with a bet, and Try called. Kassela checked in the dark on seventh, and Troy looked squeezed his cards before shaking his head and checking behind. "I got a made jack," Kassela said, and Troy nodded with a frown on his face. "It's good," he said, turning his cards face-down into the muck. That one hurt, knocking Troy all the way back to just 430,000. Frank Kassela brought it in with a , and Maxwell Troy completed with a . Kassela called. On fourth street, Troy bet and Kassela called, and the action repeated on fifth. Kassela picked up the lead on sixth street and he bet it, and Troy could not continue, pulling the ol' tuck-and-muck to drop back to about 750,000. Maxwell Troy brought it in with a , Frank Kassela completed with a , Troy raised, and Kassela called the extra bet. Troy drew a and a on the next two streets, betting both times. Kassela pulled a and called on fourth, but the he got on fifth signaled the end of the hand. Kassela is still in front, but he's slipped back to about 1.6 million. Maxwell Troy brought it in with a , and Frank Kassela completed with the same card. Troy raised to two bets, and Kassela called. 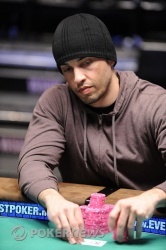 Troy bet when he pulled a on fourth street, and Kassela called after peeling a . Kassela bet out when he drew an on fifth, and Troy paired his and was forced to fold his way down to 580,000. Maxwell Troy had the bring-in with a showing, and he defended when Kassela completed with his . Kassela bet his lead on fourth street, and Troy called. On fifth, both players check-checked, and Troy led out with a full bet of 160,000 on sixth street. Kassela called, and seventh street went check-check again. "Seven-six," Kassela said, and he exposed his . "That's good," Troy responded, folding his cards under and mucking them back to the dealer. That's officially the biggest pot we've seen in eons, and it gives Kassela a pretty significant chip lead. He's up to 1.85 million now, knocking Troy down to 890,000.